Home > SEO > Content Marketing & SEO, Let’s Make them Work Together! The attention placed on the overall world of digital marketing and content creation has been tremendous over the past few years. Once you manage to get past the extensive publicity, you will find many effective case studies which are focused on examining the return of investment generated by the approach of content marketing. Must Read: How Content Marketing Can Help E-commerce Business? However, the content marketing campaigns are not paying enough attention to the importance of the digital assets optimization for search. Nothing is capable of taking an entire advantage of a search-based discovery. You may be able to create the most engaging content and it will get you some action, but it may still be buried deep inside the search engine results, where no one would ever notice it. What is the reason for these occurrences? Many factors can influence on the situation, such as making priorities among the tactics, according to the possibility of implementing them and measuring their impact. The other aspect of the same situation is when popular keywords and search engine optimization are driving the entire effort of content creation. When most of the attention is being placed on aligning all tactics and assets in order to use the search engine to attract buyers – the results can come at the expense of the customer’s experience and the content’s quality. Here comes the grand question: why would you even bother to develop great content when it can’t be found? On the other side, if the detectable content doesn’t persuade and engage – how can it be useful? It really is a paradox! Most Internet marketing experts have the tendency of gravitating towards the absolute extremes, which is not something that should be done. The definition of content marketing which is being propagated by the SEO experts states that this aspect is simply being focused on more content creation. This is quite a defective approach, which has been used to hyper-promote these techniques by the search engine optimization consultants because they are only attempting to make themselves distinctive from the competition. The core SEO programs have taken away budget and attention, which results with the entire antagonism of the content marketing definition. Content marketing is not being seen as a simple creation of great amounts of content by the reasonable and knowledgeable SEO experts. The content created by those experts is being thoughtfully developed in order to achieve particular results by attracting a specific target group. If you thought that content marketing involves only creating plenty of infographics, videos and blog posts, then you couldn’t be more wrong. The most effective approach to the online marketing is integrating SEO and content marketing. That should not be done accordingly to the agency’s capabilities, but according to the audience and its specific objectives. The reality for those brand marketers who are focused on increasing revenue and customer acquisition on monthly basis comes in the form of resource prioritization. The tactics are not the only thing that’s important here – its’ all about the implementable factors that can generate success. 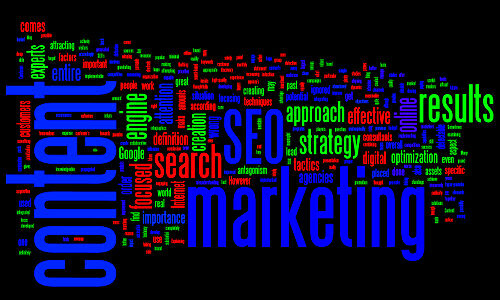 The content marketing strategy should not be focused only on the search engine and its results. It has to be implemented in all digital channels, but also in offline sources when that is possible and appropriate. The potential customers don’t find their solutions solely by the use of Google. The search results aren’t the only important touch point, although they are immensely substantial. The search engine results have a huge importance when it comes to attracting more visitors and potential customers who are actively searching right for that you have to offer. Those results should not be ignored. However, focusing only on SEO and developing more and more content is also a misunderstanding that is equally as serious as not focusing on it at all. The trick isn’t to market to Google, because Google won’t buy your products – you should focus your marketing strategy to real people because they are the real customers at the end of the day! Sometimes people have to pay SEO agencies in order to clean up the mess made by the work of previous SEO agencies – this fact is the biggest accusation against the entire SEO industries and it proves that these techniques can go completely wrong when used by the wrong consultants. The modern SEO agencies are more focused on an effective approach to the online marketing and most of them have abandoned the risky shortcuts, which gives us some hope for improvement in future. Conclusion: Let’s make them work together! The conclusion from this presentation can only lead to one statement: more content can lead to better results only if it is detectable and meaningful! For those online players that have a minimal amount of content, the creating of more (high-quality!) content will definitely improve their overall Internet marketing strategy. On the other hand, SEO’s importance in the content marketing strategy cannot be ignored, because this strategy provides an effective promotion and content organization. By combining the content marketing and SEO elements of the online marketing strategy and dosing them with the proper amounts – the improved standings in the online world are inevitable! The Internet is unimaginably dynamic and competitive, which means that only an integrated and collaborative approach to SEO and content marketing can be a winning combination.